Most of us know that Japan exported swords to China and I also briefly mentioned the official trade (kangô-bôeki, 勘合貿易) between the bakufu and China´s Ming dynasty (明, 1368-1644) in some of my publications. As always, I wanted to get to the bottom of the matter with the sword exports and did some research but it took me a while to bring the results into a comprehensive form, namely this article. We know from the 5th century Book of the Later Han (Gokanjo, 後漢書), a Chinese court document covering the history of the Han dynasty (206 BC-220 AD) from 6 to 189 AD, that Japan had contact with China since the first century BC. But it should last until the 6th and 7th century AD and the basic unification of China and Japan, that the Yamato court sent diplomatic embassies to the Chinese court, namely to the then Sui (隋, 581-618) and Tang dynasties (唐, 618-907). The aim of these embassies was basically to learn from China which was back then advanced in virtually all areas. So political systems, administration, technology, science, culture, and not to forget Buddhism was imported. Incidentally, there were altogether six embassies to Sui, and 16 (successful) to Tang China. Well, the diplomatic relations ended rather abruptly with the downfall of the Tang dynasty, but also Japan had not been able to send the last one planned for 894 because of financial reasons. But the official stop of these missions did not mean the end for Japanese and Chinese cultural, technological and religious exchange and of course also not for the increasing trade. All these free relations ended when emperor Hóngwǔ (洪武, 1328-1368) came to power and founded the aforementioned Ming dynasty after ending the Mongol empire. The major reforms undertaken by Hóngwǔ on all levels brought the law that all international contact had to be by officially legitimized tribute missions. Important to note for a better understanding of the latter sword imports of China is that Hóngwǔ imposed a ban on seafaring. Or at least the government must be informed about all things going on on the ocean because the emperor feared that former enemies could organize themselves over sea routes or that people use ships to desert to the enemy. So private trade was prohibited but a solution had to be found not to nip international and maritime trade in the bud. This solution was that foreign contries which wanted to trade with Ming China had to politically submit and to pay tribute. In return, Ming China handed-out official trading licenses to their submissive allies. But when Hóngwǔ learned later in his reign that the foreigners made a lot of profit with these official licenses and of course did not come just to pay tribute to the Ming court, he even tightened his strict rules and prohibited now all foreign trade and contact with foreigners. It is interesting to read that Japan takes up a chapter of its own in Hóngwǔ´s Instructions of the Ancestor of the August Ming (Huáng Míng Zǔ Xùn, 皇明祖訓) where it belongs to those countries which are no specific danger to China as being to far away but being described as „smart but cunning and mendacious when it comes to evading (imperial) rules“. Things changed when emperor Yǒnglè (永楽帝, 1360-1424, r. 1402-1424) came to power who was much more open for foreign trade and resumed the diplomatic relations to many countries. However, Yǒnglè continued the policy of prohibited seafaring and the tribute system but he sent out a lot of embassies to show that Ming China is now again more willing to welcome tribute missions. But still each trip abroad and commercial voyage needed imperial permission and private journeys and secret private contact to foreigners, even for officials and soldiers, was forbidden and was punished. A problem for the Ming treasury was that generous gifts were given to the countries which came and paid tribute. To counteract this, the tribute missions were again cut back and the foreign contries were informed that only those goods should be brought as tribute which were of use for Ming China. Also the number of persons attending a tribute mission was regulated as they had to be accomodated at public expense. It was shôgun Ashikaga Yoshimitsu (足利義満, 1358-1408, r. 1368-1394) who accepted the new rules and appointed himself as a tributary vassal of Hóngwǔ´s successor Jiànwén (建文, 1377-1402, r. 1398-1402) in the eighth year of Ôei (応永, 1401). Three years later, he received from Jiànwén´s successor Yǒnglè in return for the will to pay tribute the official trade license (kangô-bôeki, 勘合貿易). It is interesting to note that Ming China saw now the shôgun as “King of Japan”, not the emperor, as vassal and liaison for diplomatic relations. But although the official trade meant considerable profit for Japan, organizing a tribute mission, the prerequisite for this trade, had always been quite a task and took often several years. The organization had to base on three groups in order to be successful: The bakufu as official organizer, the merchants for providing the goods and thus the capital, and certain bakufu-loyal daimyô and monks who acted as officials, administrators and aides. The basic situation of the trade between Ming China and Japan was put in a nutshell by Zhèng Xîao (鄭暁, 1499-1566) in his Wúxúe bian (吾学編): “The foreigners want to sell, and want to buy by all means the hundred of goods the barbarians have and China cannot do without.” Each tribute mission contained three categories of goods: The tribute goods, the official articles for trade, and the so-called “supplementary articles for trade” brought by those accompanying the missions. We have records, the Zenrin-koku-hôki (善隣国宝記), of the first tribute goods sent by Ashikaga Yoshimitsu in 1401. These were: 10 horses, 1.000 sheets of thin Japan paper, 100 fans, 3 screens, 1 yoroi, 1 dômaru armour, 10 tachi, 1 katana, 1 ink stone, and 1 small desk. The next mission from 1403 contained some different goods, namely: 20 horses, 10.000 pounds sulphur, 32 smaller and bigger agates, 3 gold-decorated screens, 1.000 yari, 100 tachi, 1 boxed armour, 1 boxed ink stone, and 100 fans. So far the tribute goods. Regarding the official articles for trade, we know detailed records from the Boshi-nyûmin-ki (戊子入明記) compiled by the monk and diplomat Sakugen Shûryô (策彦周良, 1501-1579). Interesting is, that Sakugen noted also the investment necessary for each good to be made and transported to Ming China. This information served later for the projections and the profit maximization of the merchants. For example, Sakugen quotes the price of 150 kan for 100 tachi swords and 53 kan 700 mon for two fancy tachi with dragon ornamentation and nashiji lacquer saya. Before we continue it has to be mentioned that the Ashikaga-bakufu did not mint coins but imported Chinese copper coins to be used as national means of payment. It is interesting to observe that Japan had in face numerous copper mines but exported the copper to China and Korea and reimported minted coins. Chinese copper coins were a much sought-after return present for tribute goods as they stimulated the national economy and were mostly accepted throughout Southeast Asia. We even know of records that the bakufu explicitly asked for copper coins as one and only return gift for certain coming tribute mission. So 1 kan (貫), a coin string weighing 3.75 kg, consisted of 1.000 copper coins (mon, 文). We know that already the first tribute mission to Ming China using the official kangô-bôeki license from Ôei eleven (1404) took swords with them. There are numerous Chinese records of how cherished Japanese swords were, first of all because of their shaprness and cutting ability, but also because of their splendid mountings. With the restrictions initiated by Hóngwǔ, the Ming court had the monopoly on buying and distributing weapons. Some experts assume that the massive import of Japanese sword was to systematically disarm the Japanese pirates (wakô, 倭寇, Chin. wokòu) which were raiding Chinese coasts since the 13th century. Others assume that the court equipped certain soldiers with them but no definite answer can be read out of the extant documents. I deliverately used the term „certain soldiers“ because the Ming court decided – after the Japanese brought too many swords in their first tribute missions – that it will accept and buy not more than 3.000 swords per mission. Theoretically the Ming court could have had as many swords as needed. However, it can be assumed that the aim of this restriction was to maintain an overview on weapons going round in the country. At the beginning of the sword trade, the Japanese were able to sell them for a multiple of the cost of manufacture. From the diary Roku´on-nichiroku (鹿苑日録) we know that at the time of the tribute mission from Eikyô four (永享, 1432), the costs of one tachi were around 800-1.000 mon but was sold for around 10 kan, i.e. 10.000 mon, what meant a considerable profit and an important source of income for the bakufu. Japan did not follow the 3.000 sword limit very strictly and the mission from Kyôtoku two (享徳, 1453) brought 9.968 swords with them. As a counter-reaction and to somehow stop Japanese merchants from bringing to many swords into the country was, after realizing that the official limit was not obeyed, to push down the price. So it was decided that the Ming court pays no longer 10.000 but 5.000 mon per swords. And when the Japanese brought about 30.000, i.e. ten times the allowed number of swords in the course of their Ônin two (応仁, 1468) mission, the price was further pushed down to 2.500 mon. The whole system was then in a downward spiral when the Japanese tried to maintain the same profit by even increasing the number of export swords. This namely resulted in a considerable decline in quality which in turn prompted the Chinese to further push the price. At the time of the Bunmei 15 (文明, 1483) mission, only 600 mon were paid per sword, and at the time of the Eishô eight (永正, 1511) mission, the price had finally dropped to 300 mon. Incidentally, please note that these years might vary depending on how the missions are counted. Some quote the year the official planning began, others the year the mission left Japan, and others in turn the year it arrived at the Chinese authorities. Regarding, the Bunmei 15 mission, there is a report of a Chinese official extant who complained that besides of the 3.610 swords brought as tribute, the Japanese had 38.610 swords on board as their official articles for trade. This was ten times the permitted number, so the then minister Zhou Hóngmó (周洪謨). Also we learn from the chronicles and tribute records that there were each time discussions between the Japanese and the Ming officials on the acceptance of the swords exceeding the 3.000 limit and the price they are bought for. And to bear the expenses of the bakufu, it was decided on Japanese side that the merchants had to pay tax for what they sold abroad. So the merchants were quasi forced to sell as many goods as possible to reach a certain profit margin which makes the missions attractive at all. But we know that even with these difficulties, the overseas trade, including swords, was quite lucrative. To summarize: The Eikyô four (1432) mission had loaded 3.000 swords, the Eikyô six (1434) mission also 3.000 swords, the Kyôtoku two (1453) mission 9.968 swords, the Ônin two (1468) about 30.000, the Bunmei eight (1476) mission around 7.000, the Bunmei 15 (1483) mission 38.610, the Meiô two (明応, 1493) and Eishô eight (1511) missions each around 7.000, and the Tenbun eight (天文, 1539) mission 24.152 swords. That makes altogether around 128.000 swords, an average of about 12.800 swords per mission. The very last tribute mission was undertaken in Tenbun 16 (1547) before the system collapsed due to the domestic political problems and the appearance of European competitors in the East Asian waters. Incidentally, I wasn´t able to find a list of how many swords were brought in the course of the last mission or if it contained any swords at all. But the aforementioned number of 128.000 swords over about one century gives us nevertheless a general idea of how many swords were exported to China. The Boshi-nyûmin-ki tells us also something about the lead time for a tribute mission. The preparations for the Ônin two (1468) mission started already in the Hôtoku era (宝徳, 1449-1452), i.e. more than 15 years in advance. On the other hand, the preparations for the Bunmei eight mission took only about two years. So when we take here an average of let´s say five years lead time, around 2.560 swords had to be made in that time to arrive at the aforementioned average of 12.800 swords per mission. This means 512 swords a year, thus more than a sword a day. So when the Bunmei eight mission had only a lead time of two years, 6.400 swords must had been made each year what calculates around 17 swords per day! So the smiths involved in the Ming trade system must had been quite busy. According to contemporary records, most of the export swords were made in Nara and Bizen and the production was mainly managed by Kyôto-based sword dealers who in turn were of course in touch with the bakufu. Another factor which should not be overlooked is the fact that the Ôuchi family (大内), which was largely involved in the overseas trade and tribute missions, were shugo military governors of Buzen and Chikuzen province during that time. So the number of smiths settling there in the early Muromachi period was probably also connected to the mass production of export blades. For example, there exists a tachi signed „Nobukuni“ (信国) which bears a Chinese nengô, namely „ninth month Chénghùa two“ (成化二年九月), what corresponds to the first year of Bunshô (文正, 1466) (see picture 2). This is an important reference pieces as it is one of the very few export swords which did not make it abroad for whatever reason. And this Nobukuni blade is also of special interest as it backs up the transmission of the Kyôto-based sword dealers where the origins of the Nobukuni school were, and the founding of the Kyûshû-offshoot the Tsukushi Nobukuni school (筑紫信国). Back to the prices of the swords. From an intresting entry in the Boshi-nyûmin-ki we learn that the price the Ming court paid was for the blade and the koshirae. The entry in question deals namely with 300 swords which arrived damaged with the Eishô eight (1511) mission. According to the records, the Ming officials sorted out those swords whose hilts and scabbards were damaged and beyond repair and threw them away. So the blade alone was obviously not worthy purchasing, maybe just because there came anyway 4.000 swords more than allowed with this mission. Also we read that swords were damaged by Chinese port staff during unloading the cargo upon which the Japanese got angry as they were not able to repair them locally and lost so a part of the calculated profit. Apart from that there are several Sue-Bizen swords extant which show the value of the sword on the tang. For example a katana by Osafune Norimitsu (則光) dated Kanshô five (1464) worth 5 kan, a wakizashi by Osafune Katsumitsu (勝光) dated Bunmei nine (1477) worth 20 kan, a wakizashi by Osafune Tadamitsu (忠光) dated Entoku two (延徳, 1490) worth 1.000 hiki (疋 = 10 kan), a tantô by Osafune Katsumitsu dated Eishô three (1506) worth 1 kan 500 mon (see picture 3), or a katana by Osafune Sukesada (祐定) dated Eishô twelve (1515) worth 5 kan.
Picture 3: tantô, mei: „Bishû Osafune Fujiwara Katsumitsu“ (備州長船藤原勝光) – „Eishô sannen nigatsu-hi – dai ikkan gohyaku-mon“ (永正三年二月日・代一貫五百文). 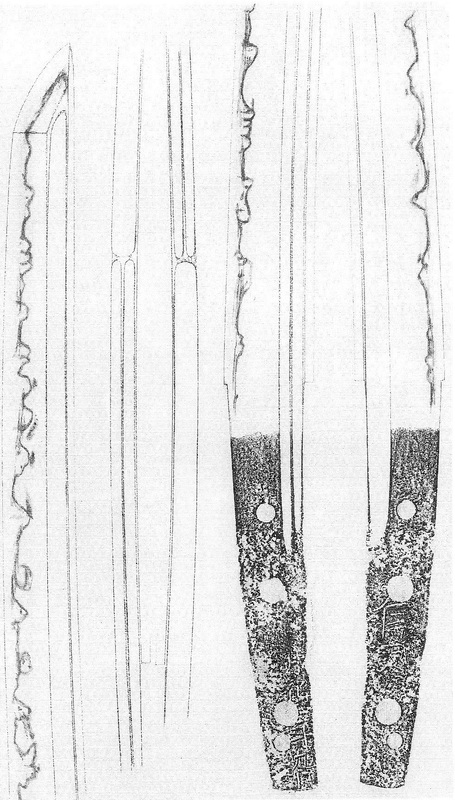 Although it is hard to define inflation and price fluctuation in Muromachi Japan, the prices mentioned on the tangs of these Sue-Bizen blades indicate that they were probably not made for export. As mentioned earlier, the costs for one tachi for the Eikyô four (1432) mission were around 800-1.000 mon, i.e. 0.8-1 kan. The Norimitsu katana from 1464 was worth 5 kan but as we have heard, the Ming court pushed the price for the Ônin two (1468) mission down to 2.500 mon, i.e. 2.5 kan, per blade. So exporting this Norimitsu blade would have meant a loss. And when the Sukesada blade from Eishô twelve (1515) was worth 5 kan, the Japanese swords from the Eishô eight (1511) mission four years early had to be sold for 300 mon, i.e. 0.3 kan. This in turn indicates that the smiths making the export swords really must had been making low-quality kazuuchi-mono that a salling for 0.3 kan still brought some profit! Of course there were surely some fine swords reserved for certain persons but maybe this is a reason why there are not that many swords extant in China which were once bought by the Ming court. We can assume that a sword made for considerably less than 0.3 kan did not survive much fighting action, not to mention repeated battles in the cases handed down within a family. That means the Sengoku-era kazuuchimono extant today must be considered as being of even better quality than the majority of the swords made for export. Great reading! Is it known, how many Japanese swords are extant nowadays in China, brought by this missions? Thank you Uwe. I have never heard of any locally preserved sword but I have to admit, I never did any research in this direction. Possible that someone knows a few in Chinese museums? Some years ago I briefly owned a Chinese style saber, but the inscriptions on the blade suggested it was made in Japan. An interesting piece, one more of similar style and with identical inscription turned up in China as well. Unfortunately, not many swords were preserved in China itself due to the Cultural Revolution and Great Leap forward where collecting was banned as a bourgeois activity and any and all iron or steel was to be melted in backyard furnaces. Entire collections and old army depots were destroyed in this way, the few swords that remain have suffered about a century of neglect, sometimes more. Today, it’s common to find active rust even on imperial pieces in the Palace Museum in Beijing. We can only imagine what the depots of lesser items look like. If there 128000 pieces of Japanese swords were exported , where are they now???? Though cultural revolution did consumed many swords for their steel, I doubted by 1950s there were plenty of extant Japanese made swords. Could it be possible the Corruption in Ming Court or the merchants in china had reexported them to Indochina?? Since many more extant japanese blade sword in Indochina refurbished with Indo China style fittings. Good question. Some indeed do assume that the need for steel later meant the final coffin for local Japanese swords but unfortunately, I am not aware of any mainland period records that deal with what was really done with all the imported Japanese swords in detail. Would be an interesting research topic for local experts, or it would be nice to “unearth” studies on that topic from Chinese and/or Southeast Asian facilities. A few Ming records speak of popularity of Japanese swords among Chinese sword colllectors and high ranked officials. I haven’t been able to find records on what exactly they did with those large numbers. It could well be those records also perished. In 1900, Beijing’s largest library, the Hanlin, was burned to the ground and only a handful books survived. The Ming Yongle encyclopedia was in there, possibly a lot more Ming material. As for where they are now, very few antique Chinese swords remained, period. Especially when you consider the Qing army alone consisted of about a million men, the scarcity of weapons is amazing. (I deal in antique arms and specialize in Chinese swords.) Perhaps many perished long before the final blow in the 1960’s, we’re not sure. There has been lots of upheaval and social unrest troughout the 19th and 20th centuries where the need for steel to make more modern arms may have destroyed some already. Korean swords are even more rare than Chinese after being disarmed. In fact the position of Japan is quite unique in the world with the quantity of old material available. As for trade, we do know many Japanese swords went to Vietnam but I don’t know whether they went directly or through China. Another topic that is worthy of investigation! Thank you for the clarification and the additional input on this issue Peter! And yes, the Japanese combination of plenty of references in terms of actual objects AND records on them from all periods is quite unique. Interesting discussion. I have two swords I believe were Japanese export items as they are stylistically much closer to Chinese and South East Asian swords of the same period. I have been looking for these swords for decades and they are indeed rare and unrecognised. The two I believe were re-imported to Japan, most likely as war trophy and so were maintained good condition. What are the exact Ming sources which dealt with the matter? I browsed the relevant chapters of “Ming shi” and some “Ming shilu” and found nothing which met the fanciful information from Japanese sources! Could you kindly point these Ming sources? BTW I personally have the blade of Chinese sword made after Japanese sample – it has the shallow curvature, no yokote exists and, of course, no iori-mune. The main thing – the tang – is typical for Chinese swords and the length of it assumes that it was designed for one-handed grip. I weighed it and compared with some Japanese katana which were at the hand at that moment – the Chinese sword was much more massive and to wield it one must be much stronger than an average samurai. It is indeed interesting that period Chinese sources like the Ming Shi, Ming Shilu, and Da Ming Huidian do not bother to deal in detail with what the missions did and what goods they brought for trade. To my knowledge, they only record the fact that Japanese ships with envoys and tribute arrive in Ming China at certain times and when for example laws were broken. For whatever reason, the period Japanese sources are much more detailed in this respect and this was what I am was focusing on (also of course because I can’t read/speak Chinese). I suppose you know the paper of Prof. Ma Mingda regarding the influence of Japanese “way of sword” to Chinese methods of fencing. He argued that the excess of Japanese swords were used to arm the Imperial Guard (Yulinjun). But frankly speaking I remember the only case of arming Yulinjun with Japanese weapon – it was 1918 when the Chinese pickled troops which had the nickname of “Yulinjun” were armed with Japanese rifles, machine-guns, cannonc etc. As one may see no Japanese swords detected at all! To say more – a lot of 2-handed Chinese swords which could be regarded as imitation of Japanese ones has the typical Chinese blades of significant length. And these swords are called often wodao (not 倭刀, but 窩刀 – to avoid mixture with Japanese swords). I am very grateful for your attention paid to this problem and probably I may try to ask you kind assistance to investigate the matter.